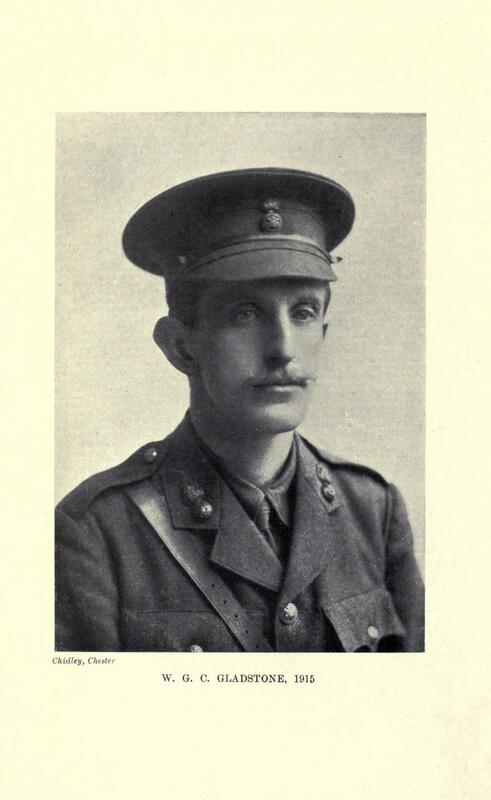 On 13 April 1915 William Glynne Charles Gladstone, the grandson of the late Prime Minister, became the second Member of Parliament to be killed in action during the First World War. He died at the age of 29 near Laventie, in France, after being hit in the forehead by a rifle bullet as he tried to locate a German sniper. 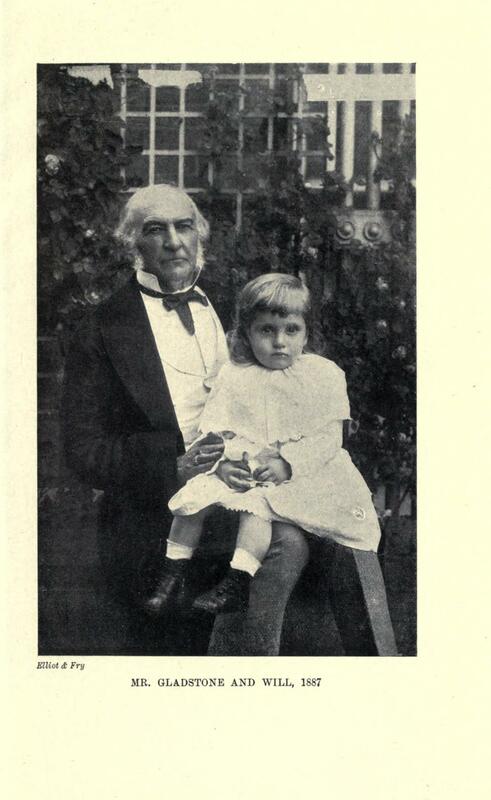 Born on 14 July 1885, just after the end of his grandfather’s second premiership, Gladstone was the only son of William Ewart Gladstone’s eldest son, William Henry, who died of a brain tumour when Gladstone was not quite six years old. His mother Gertrude, to whom he wrote regular letters while he was serving in France, was the youngest daughter of the 12th Lord Blantyre. Educated at Eton and at New College, Oxford, Gladstone developed his debating skills as president of the Oxford Union, and gained a second class degree in History. When he came of age in 1906, he ‘threw himself seriously and thoroughly’ into the management of the Hawarden estate in Flintshire, which he had inherited from his grandfather. It was almost inevitable that Gladstone, who described himself as ‘a Liberal both by temperament and conviction’, would pursue a political career, but he was well aware of what a hard act his grandfather would be to follow. In 1910 he wrote to his uncle that ‘I have a great dread of falling short of expectation; people insist on thinking that one has inherited more than one has from one’s grandfather’ and decided that he would not try to enter Parliament ‘before making sure that I have derived necessary experience and qualification’. Gladstone’s connections helped him to secure some interesting opportunities to gain experience in the wider world. He spent several months in Ireland in 1909 as assistant private secretary to the Lord Lieutenant, Lord Aberdeen. In 1910 he visited India and Japan, and in January 1911 he arrived in Washington for a stint as honorary attaché to James Bryce, the British ambassador, who had held office under his grandfather. He has a clear voice of a distinctly musical quality … He has a good memory, for the notes are microscopic and usually limited to a diminutive postcard … He has a ready wit, a caustic humour, and, like his great namesake, deep, silent convictions that make him, on occasion, blaze into righteous indignation. I feel for ever doomed to fall short of the expectation which might conceivably, and very incautiously, be formed by some, of one who bears the name I do. On that ground, as well as on the more manifest ground of inexperience I ask the indulgence of the House. He was not a regular speaker, but made important contributions on the question of the disestablishment of the Welsh Church. He shared his grandfather’s commitment to Home Rule for Ireland, speaking in support of the second reading of the 1912 Government of Ireland bill. When war broke out in 1914, Gladstone was involved with the recruiting campaign in Flintshire. Although he wrote in August that ‘far from having the least inclination for military service, I dread it and dislike it intensely’, he enlisted himself. He initially had the idea of joining up as a private, but was advised against this, and was instead commissioned as a second lieutenant in the 3rd Battalion of the Royal Welsh Fusiliers, based at Wrexham, 12 miles from Hawarden. A guide from the company we were to relieve met us at dusk at our billet, and we marched off, soon reaching the trenches along a low-lying ditch in single file, welcomed by the whistle of stray bullets. Poignantly, this last letter home remained unfinished on his writing pad when he died on 13 April. With the permission of the Prime Minister and the King, Gladstone’s body was exhumed and brought back from France for burial alongside family members at St. Deiniol’s Church, Hawarden. He was one of relatively few of those killed in action to be buried at home, as his case prompted Major Fabian Ware (later the vice-chairman of the Imperial War Graves Commission) to secure an order from the Adjutant-General banning future repatriations, wishing to have equality for all classes in death. This entry was posted in 19th Century history, 20th century history, military history, social history, World War I MPs and tagged Liberal Party History, MPs to fight in World War I, Parliament, William Gladstone, World War I. Bookmark the permalink.